This book contains extracts from early Muggletonian sources, mostly from the bequests made to the British Library. This is very much a preliminary examination of the available documents and the editor states that "This treasury of sources awaits the further examination of enterprising scholars". Differences between the 1656 and 1661 editions of "A Divine Looking-Glass"
This book contains some very interesting works in a modern font, retaining the original spellings. Elements of the contents are very hard to obtain and it is therefore a very worthwhile volume. 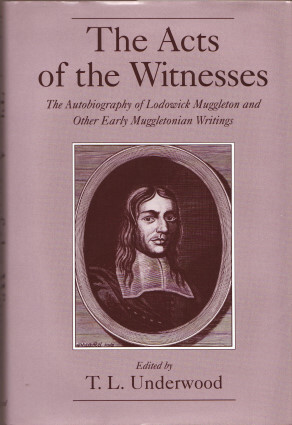 The editors wish that future scholars would examine the available documents was fulfilled in the form of William Lamont's excellent work "Last Witnesses".